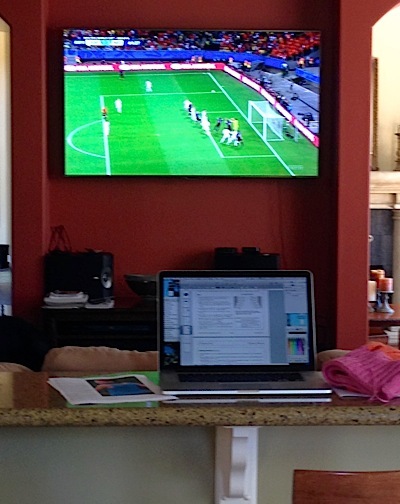 I’m ecstatic the World Cup is finally here and I’ve been planning my knitting workload accordingly. As mentioned in the last post, I am anxious to finish the summer shell I’ve been working on. The basic shape is a tube top with some interesting spaghetti straps on it. This means I’ll be binding off the main body before adding the straps. I’ve decided to use the smooth look of an i-cord bind off, which presents an opportunity to review some of my favorite i-cord bind off tips. 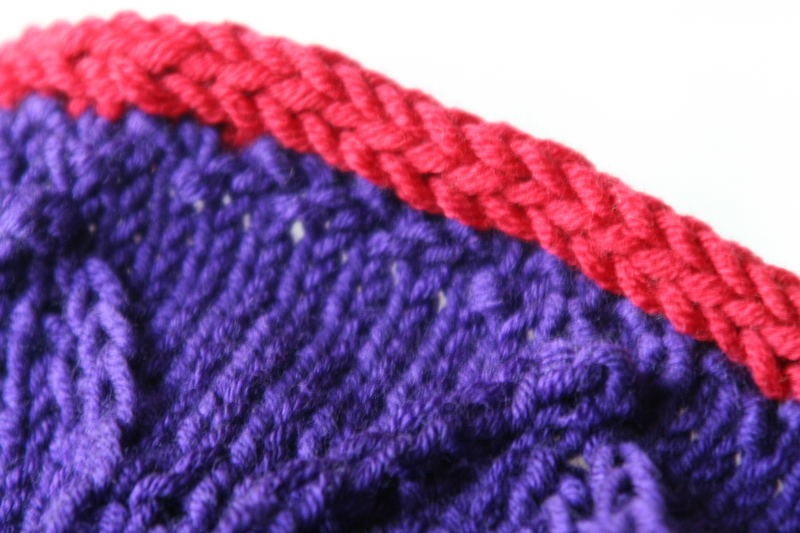 One of our most popular photo tutorials is the one Sarah Fama wrote for us on the basics of the i-cord bind off. You can find it here on our web site. 1. 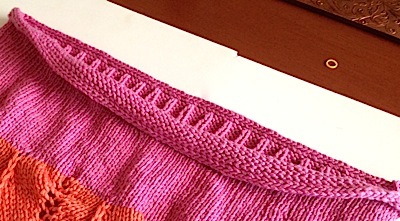 Number of Stitches: The i-cord has to be loose enough to fit over the shoulders but still snug enough not to gap. It’s a tough balance to reach. I like to knit a 4-stitch i-cord since it provides a bit more give. 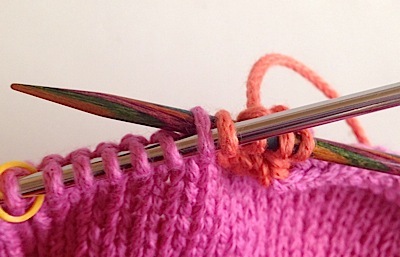 The extra stitch creates a longer i-cord, so make sure you knit the first stitch of the i-cord tightly. 2. Elastic Core: Here’s another fantastic benefit of a 4-stitch i-cord: it forms a complete tube. This allows you to fine tune the fit by running a thin bit of elastic through the center of the i-cord. 3. SSk or K2tog Through Back Loop: The i-cord bind off is worked from right to left so working a left leaning decrease is more seamless. I’ve tried both a ssk and just knitting through the back loops and both work. It’s even more important when knitting a contrasting color bind off. So there I am watching the stunning 5-1 defeat of Spain in their opening match, humming along with my 4-stich i-cord bind off. I was so focused on the game, I didn’t remember to pull the first stitch tightly. Such is my dedication to you that I finished the other half with the correct tension for comparison. I know it probably means I’ll need to rip the entire thing out and bind off again. Good thing there are 28 more days of matches left. The i-cord here is a good 2″ wider than the top. Not good, it means the top edge will sag. 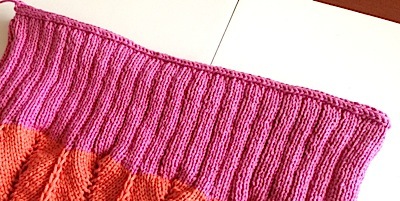 Look how much nicer it is when knit properly. Works well for hat brims too! Not to panic, I still have tip 2 up my sleeve. Let’s see how that works. HI THERE. I WOULD LIKE TO KNOW HOW CAN I CAST ON WITH THIS TECHNIQUE TO KNIT A HAT? THANK YOU VERY MUCH. Jenny, Yes, it makes a great hat bind off. You just need to start with a provisional cast on, then when you are done with the hat go back to the brim and bind off with the i-cord. We have a nice provisional cast on photo tutorial in the Techniques section of our website. Here is the link. This entry was posted on June 14, 2014 by Laura Cunitz in Edges, Nuances, Tops and tagged i-cord bind off.